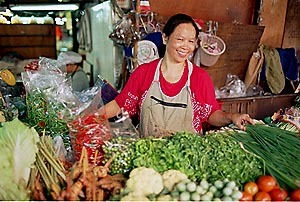 I think it’s high time ya’all meet our regular veggie vendor at Ton Payom market down the road here in Chiang Mai. Mrs. Cheebwangkham, otherwise known as “The Vegetable Lady,” displays some of the prettiest, healthiest (yes, we do find the occasional worm) goods in town. Of course, the market is full of stalls like these, but we keep returning to Cheebwangkham. Most people around here develop a relationship with their food vendors. Cheebwangkham is always happy to see us after a long absence, she’s come to know our tastes and she usually knocks a few baht off the bill. This sort of personal connection is one of the things I love about shopping in Asia. No Saran-Wrapped cardboard tomatoes stocked by a stranger; nothing that’s been on a truck for days on end. It’s good to know your veggies come from nearby farms, and it’s good to know the lady who sells them! Who new veggies had protein? What’s a few worms between friends? I wish we had access to fresh fruit and veggies like that! We only get a farmers market in the summer, and it’s not real convenient (the other side of town). 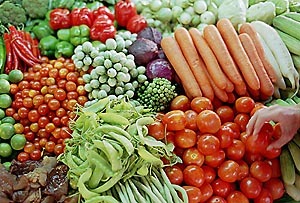 It’s too bad that people in the states are so disconnected from the sources of food, they might eat better here if the quality of the produce was better! For those of us in the U.S. lucky enough to have year round farmers’ markets, you have given all the right reasons to frequent them, Karen. Yes, we’ve got the requisite worm and bug population, familiar people offering their best stuff, and the best strawberries ever. All organic. The cherries are a bit watery this spring, but that’s the only complaint.